Menu boards are essential when owning a restaurant. 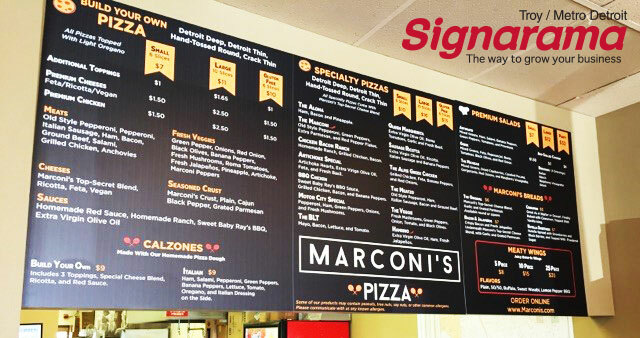 Signarama of Troy provides menu board solutions for any budget! If you are a multi-location restaurant looking to have a certain concept or are opening a brand-new restaurant we have the right solution for you. 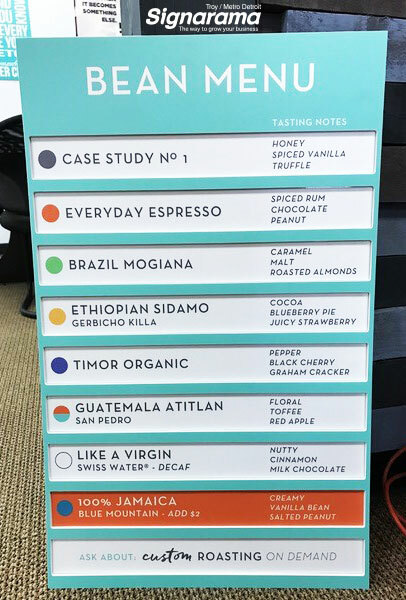 Static printed menu boards can be printed at different custom sizes & the full color print is printed directly to the material. This type of sign is a good solution for menus that do not change very often. Snap frames are perfect for this type of sign because they allow for easy changing when needed. Static printed menus are the least expensive type of menu board. Dry erase menu boards are a perfect solution for a menu that will be changed often. Dry erase menu boards are printed on a rigid material & have an overlaminate that makes it dry erase. This type of menu board will allow you to change the pricing of a product or the special of the day easily. Magnetic menu boards can be used if you offer certain dishes on certain days. Signarama of Troy can assist in designing the board so that it has slots where you can remove magnets & replace them with others. Digital screen menu boards are perhaps the ultimate solution in menu signage. Our digital menu signs allow you to customize your menu screens by the time of day, special menu options, & even change the pricing as often as you would like by logging into our web-service. You can even add video! Subscription fees do apply for all digital signage but seeing your menu in video format on a large screen makes it well worth the cost!